Mighty Quinn’s barbecue restaurant has become a Manhattan institution. 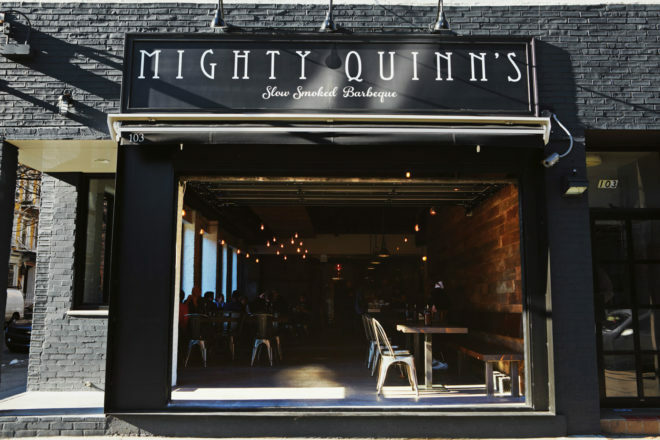 Mighty Quinn's is becoming a New York institution. The humble barbecue is making a comeback with a string of impressive smokehouses to try in our beloved NYC. Barbecue restaurants, also known as smokehouses, are the hottest ticket in NYC this summer. Recently named best barbecue restaurant in the city by Time Out NY, Mighty Quinn’s (mightyquinnsbbq.com) is quickly becoming a Manhattan institution. The eatery began life as a simple stall at food incubator Smorgasburg in Brooklyn’s Williamsburg, before branching out into the very cool East Village early this year. Eating there is typical of any hot new NYC eatery – challenging. Scrabble to get a seat while someone else in your party joins the food queue out the door. Then the canteen-style servery delivers your choice of juicy spare ribs, tender pulled pork or brisket. In true American style, you either order your meat as a single serve or by the pound. Sides of burnt-end beans or edamame with peas gives your meaty dinner some balance. The bar features some classic NYC craft beers; Sixpoint: Sweet Action is our pick. Other top barbecue joints we can recommend include Fette Sau, (fettesaubbq.com), Fatty Cue (fattycue.com) and Blue Smoke (bluesmoke.com). For first-time barbecue consumers in the US, here’s a quick tip: Barbecue is considered a very ‘Southern thang’ so expect very ‘salty and sweet’ sauce splashed liberally over your plate – we recommend you ask for the sauce on the side.